Fulfill your New Years Resolution w/Swagbucks! January 1st is famously known as a time of New Year’s Resolutions and we always hear a lot of talk about trying to live a healthier lifestyle this time of year. It’s hard to do by yourself though, especially as the colder months set in. If you've considered a get-fit New Years Resolution this year, We've got the site to help you keep it, and save some cash too! Shopping with Swagbucks can help you get ahead of the game, while earning tons of Cash Back on New Year’s Resolution deals this New Year. It’s time to make your 2016 Resolutions stick! 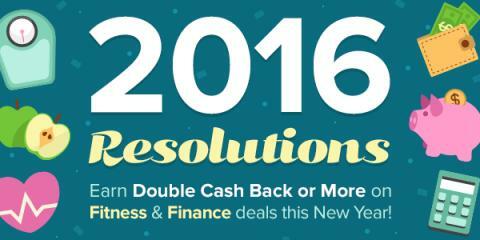 So have Swagbucks help you reach your 2016 Resolutions! Sign up here. 2016 promises to be the best year yet so get a head start on your goals. Have a health, fitness or financial New Years Resolution? Share it in the comments and tell us how well you've been able to stick to it so far! Disclosure: This is a sponsored post for Swagbucks. I am a part of the Swagbucks Influencer Program and will receive compensation for referrals through my links.